Hall of the Mountain King: Review: Danzig, "Deth Red Sabaoth"
Instead of the experimental and electronic-influenced music that Danzig has been dabbling in for the last 15 years or so, he has stripped things back on this record for a raw, dirty and mean sound that recalls his best work of the past. If you missed that slightly bluesy and heavily doomy sound of Lucifuge, you’ll be pleased to hear it return in full force on this record. Don’t get me wrong, Deth Red Sabaoth is not Lucifuge – my personal favorite Danzig record – not even close. But it’s a damned good record and easily Danzig’s best since How the Gods Kill. Initially, I was a bit turned off with the sound quality of the record. It was intentionally designed to have the feel of an album recorded in the 1970s, and it does. After a couple of listens, though, I’ve settled into the songs a little and the stark production is kind of fitting for the stark arrangements. After getting off to a bit of a slow start with opener “Hammer of the Gods,” things begin to warm up with second cut “The Revengeful.” The big, squealing guitar riff backed with a classic Danzig vocal delivery sounds a bit like a cross between something from the first album and I Luciferi – but that’s a good thing. The lead guitar on the track also stands out, though perhaps not exceedingly technical, I really like it. Things really settle in, though, with the dark march of “Rebel Spirits,” one of my favorite songs on the record. It’s very much in the mold of Lucifuge or How the Gods Kill, grooving, memorable melody and Danzig in his best Elvis meets Jim Morrison meets Satan mode. The bluesy rhythm returns on “Black Candy,” and while the lyrics are perhaps a bit unimaginative, it’s a good song all the same. But that vibe really kicks in on “Ju Ju Bone.” After a cool spoken word intro to the lyrics that gives the tune an Elvis vibe, it turns into a great, grooving, bluesy, voodoo-tinged slab of a song. I dare you to listen to it and not find yourself grooving along. There’s plenty of gloom and doom, as well. “On a Wicked Night” is the dark, largely acoustic number for this record. It’s not as refined as “How the Gods Kill” or as raw as “I’m the One,” but it’s the strongest song he’s done in this vein in years. “Night Star Hel” delivers hands down my favorite guitar riff on Deth Red Sabaoth. It’s doomy, evil and black – classic Danzig. Not every song is golden, though. “Deth Red Moon” features a riff reminiscent of “Mother,” but is one of the less memorable tunes. A late pair of songs, “Pyre of Souls: Incanticle” and “Pyre of Souls: Seasons of Pain” are also forgettable. The first of the two is an acoustic piece with Danzig chanting and moaning that really doesn’t hold much interest for me. The second part is heavier and better, but still not great. He does close the record on a high note, though with the classic Danzig dirge “Left Hand Rise Above” with a great, gloomy vocal delivery. If you’re one of those old school Danzig fans like me that thought he’d never deliver another record as good as those classic albums, I’m happy to report that we were wrong. 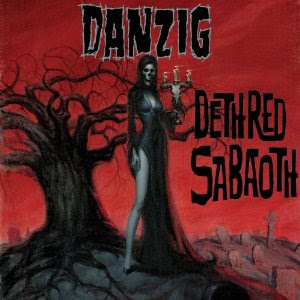 Danzig is back in all his gloomy blackness, and Deth Red Sabaoth is well worth your time and attention.